Happy Wednesday Hump Day — also known to us as Celebrity Baby Bump Day. We rounded up the cutest pregnant celebrities of the week including Naya Rivera, who showed off her baby bump in an adorable bikini while on a babymoon. Jessa Duggar confirmed she is pregnant and expecting her first, while Soul Surfer‘s Bethany Hamilton posted an awesome pregnant surfing photo. Jessie James and Jaime King round out our list of the most buzz-worthy baby bumps of the week. The Duggar family wastes no time in starting a family! The 19 Kids and Counting star Jill Duggar just welcomed her first baby — and now her sister Jessa Duggar is expecting her first child with her husband, Ben Seewald. Rumors have been flying for a few weeks that the 22-year-old was pregnant, especially after a few Instagram photos that conveniently had her midsection covered. The couple confirmed today that they are indeed pregnant and are expecting their child on Nov. 1 — which also happens to be their anniversary. She posted the above photo on Instagram of her husband Ben with his hand on her baby bump while the two newlyweds look into each other’s eyes. 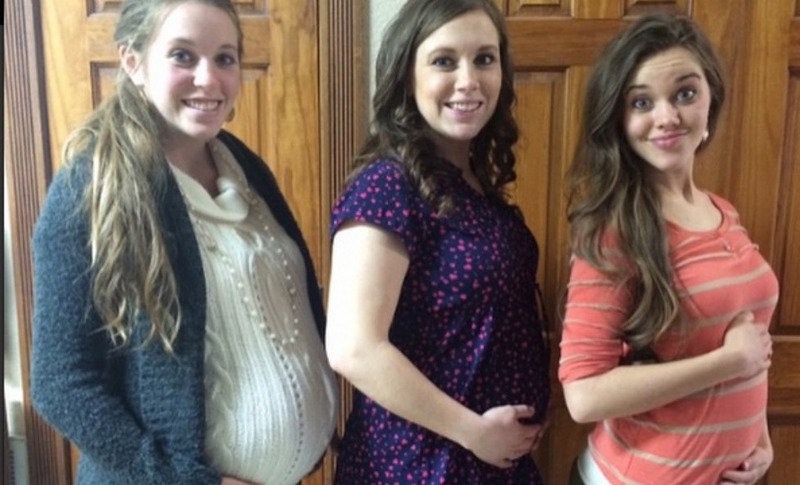 Jessa’s sister-in-law, Anna Duggar, posted this cute snapshot of the newly pregnant Jessa with pregnant Anna and Jill Duggar, who just recently gave birth to baby Israel. “Congratulations Ben & Jessa on your pregnancy! It was so fun to have all 3 of us pregnant together!! !” Anna captioned the photo. Jessa told People that she took a pregnancy test before church and showed Ben the positive results.